A total bronze kit for eyes, lips & cheeks! 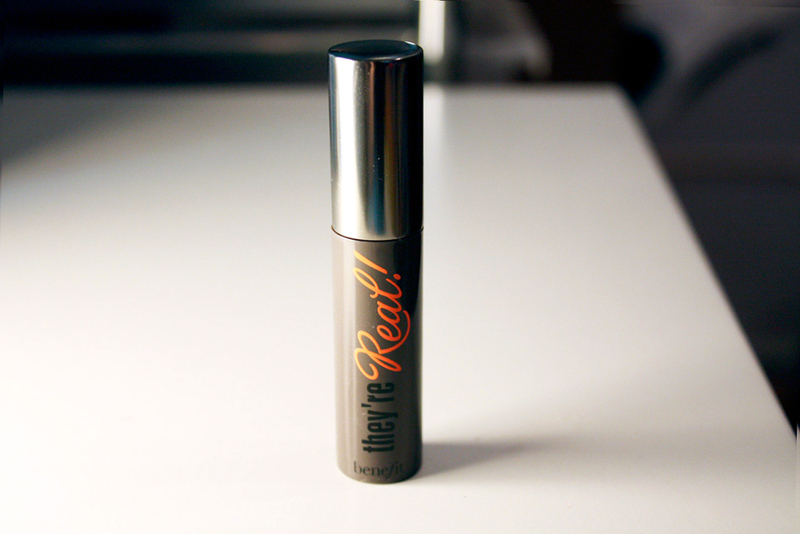 Anyone that knows me will know of my love for benefit cosmetics, my favorite mascara (which I shall do a full review on at some point) is Benefit’s “they’re real” mascara. So when I received this box of little gems from my boyfriends Mum I was more than a little bit excited! 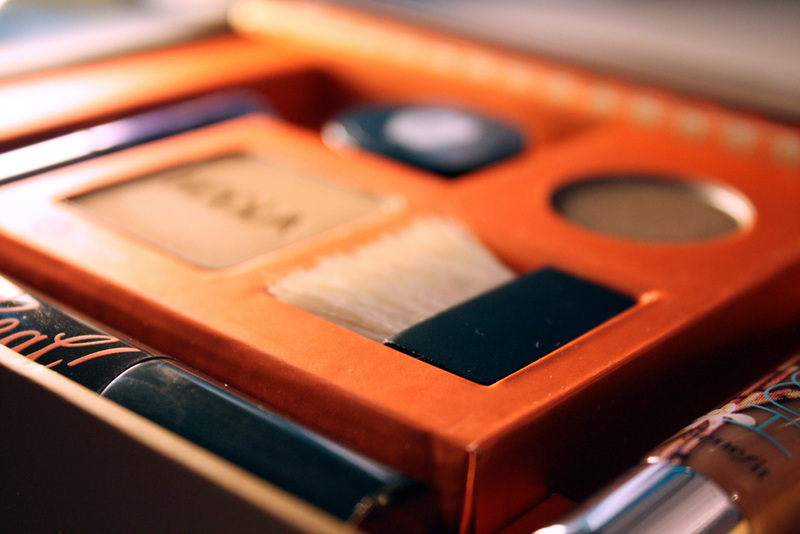 The box contains everything you need to look lovely and bronzed, minus foundation though. Saying that I think this kit would be ideal to take away on holiday, especially when you don’t want to wear lots of make up in the sun! Plus it’s so compact that it will save you some room for a few extra bikinis in your luggage, as you really wouldn’t need anything else! Okay back to the review! 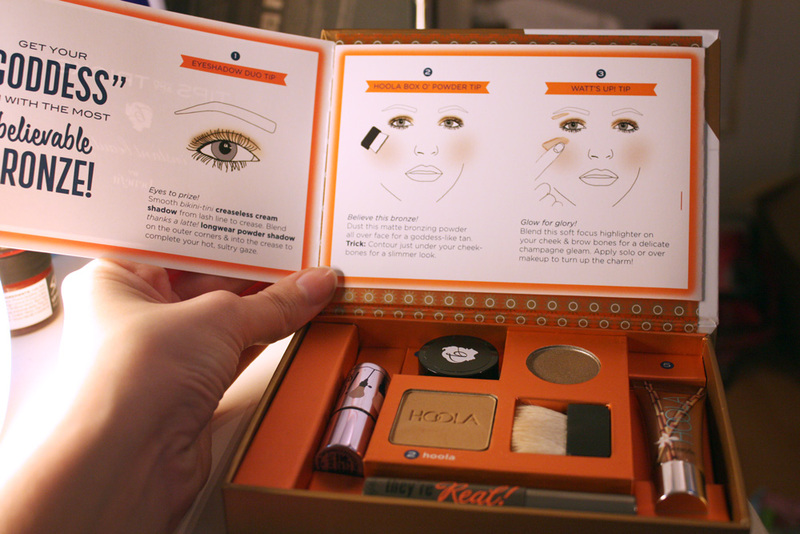 The kit is in a book-like box as quite a few of benefit’s kits come in, the lid of the box has a flip out booklet that shows you how to apply each of the products with application tips and tricks – once fully open you will also find a little mirror underneath. I’ve wanted to try this bronzer for ages! So was very happy to finally get the chance to test it out. 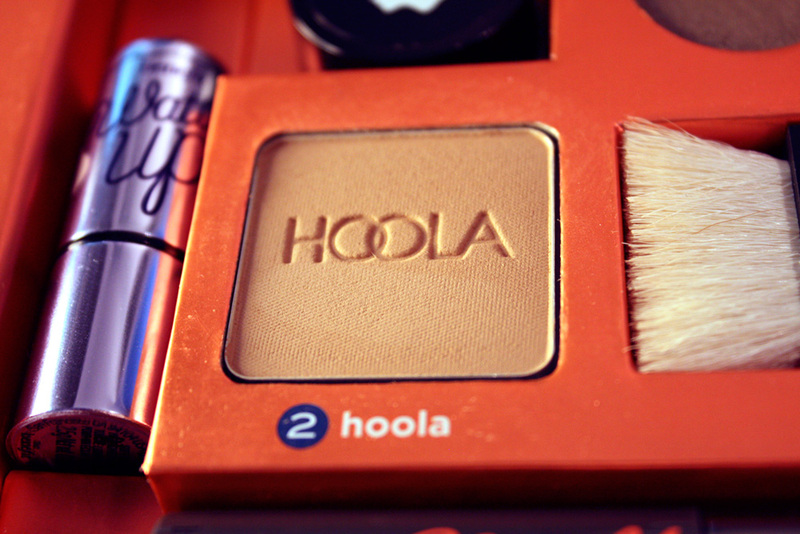 Hoola is a brown based bronzer so should suit quite a range of skin tones without looking orange, you could definitely build it up to get a darker colour if you require. 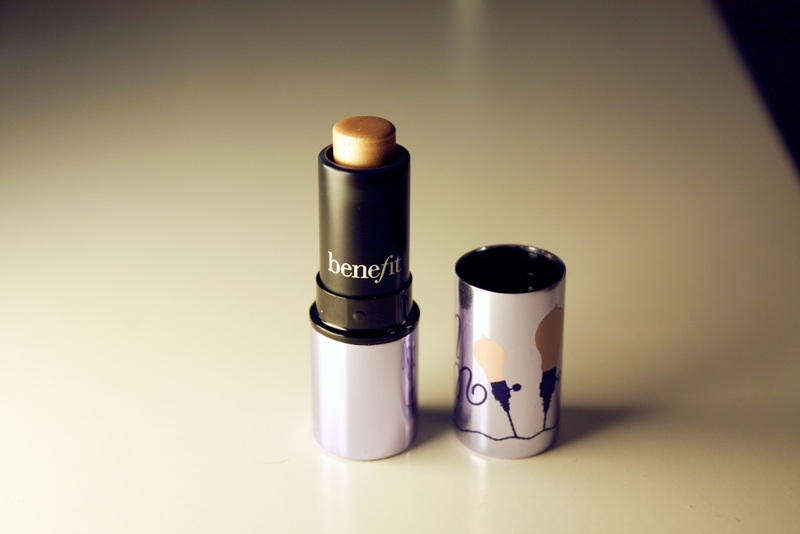 It creates a nice sun-kissed glow when brushed across your face. 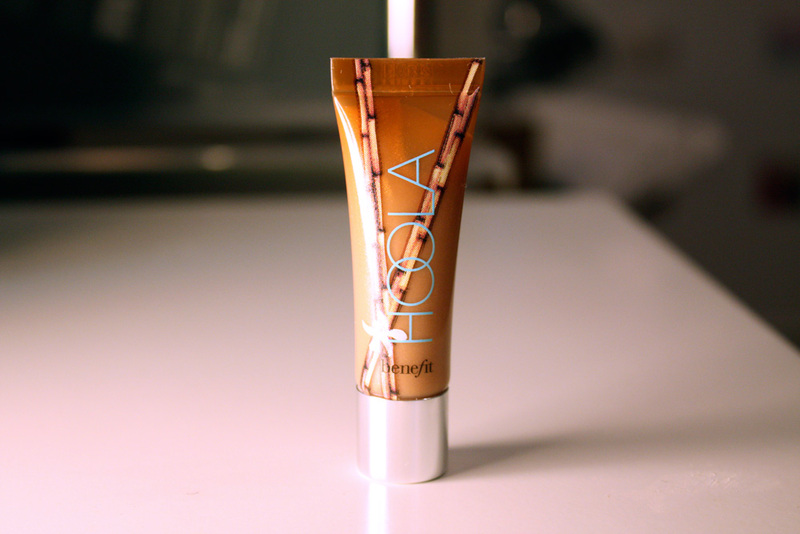 A great thing about Hoola is that it’s got no shimmer in it, meaning it’s the perfect matt shade for contouring! 2 in 1 product! 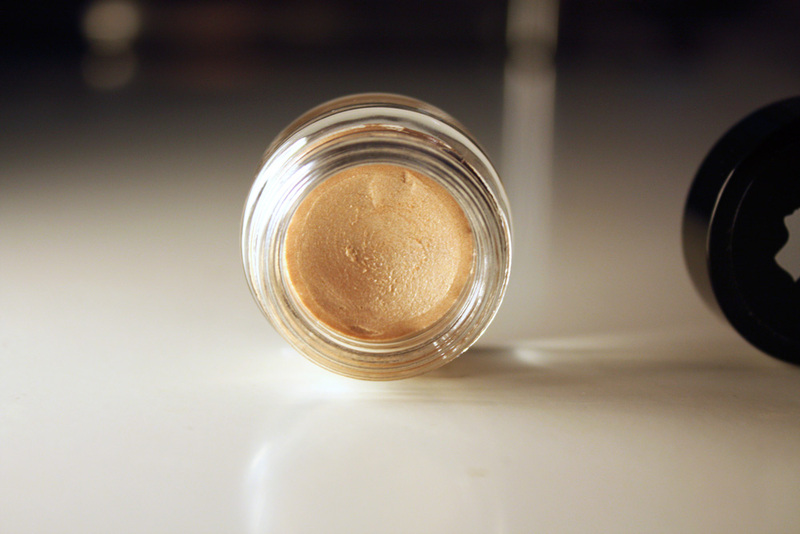 The powder is so soft and doesn’t feel cakey on the skin at all, a perfect natural finish. The powder brush in this kit is really good at picking up the product so be careful not to get too much on your brush- you don’t want to look stripey! 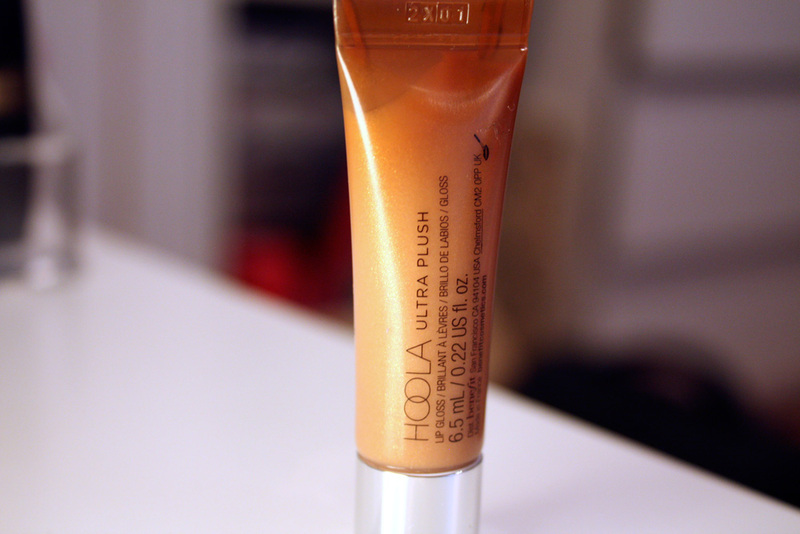 The Hoola lip gloss is a perfect partner to the Hoola bronzer, the shades compliment each other perfectly. It’s a non sticky, sweet smelling (love the taste! ), subtle lip gloss that adds a hint of colour with a lovely golden shimmer to your lips. 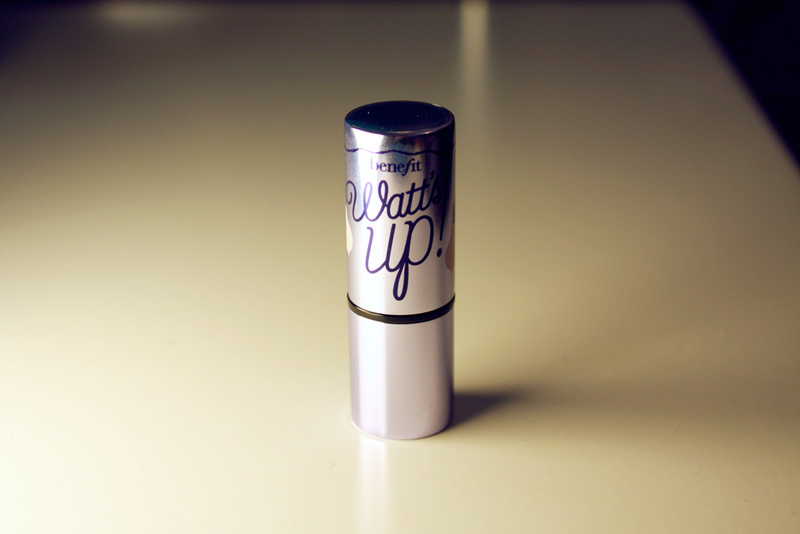 Alternatively you could apply it over the top of a lip stick to add some shimmer along with using it just on its own. Having not owned a cream highlighter I was quite excited to try this out. The highlighter itself is a light champagne shade which I feel would suit a lot of skin tones. It blends out very easily so you won’t be left with any harsh lines, it doesn’t clog your pores or feel heavy on your skin. I love the fact it highlights without the need for glitter, so this will look lovely and natural if you’re going to be in any photographs. The kit features one of benefits creaseless cream eye shadows in bikini-tini, which is a shimmery champagne colour. I personally love this colour, it’s very wearable and easy to apply-I just use my fingers as this helps to spread the product evenly over the eyelid. The product is very soft and light and doesn’t feel greasy on the skin. It’s also lived up to its claims of being creaseless too! It lasts a long time too! Just make sure you put the lid on properly after use, as I imagine it could dry out quickly. 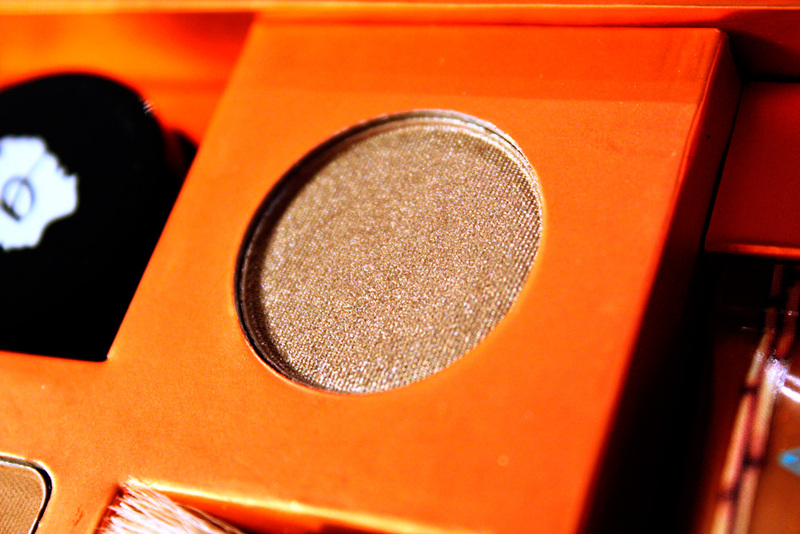 A very pigmented shimmery browny taupe colour, very wearable shade – especially for those with blue eyes! POP! It’s great for the outer corners of your eyes if you team it up with the bikini cream shadow, it blends nicely and doesn’t have much fall out. I love this mascara! No lie! It just makes my eyelashes look so much longer, fuller and blacker! It lasts all day and doesn’t look clumpy. The wand has slightly curved ends with a spiked ball on the end to reach those hard to grab lashes! I personally only use one coat of this, but I wiggle the brush to coat all my lashes to give me some more volume. 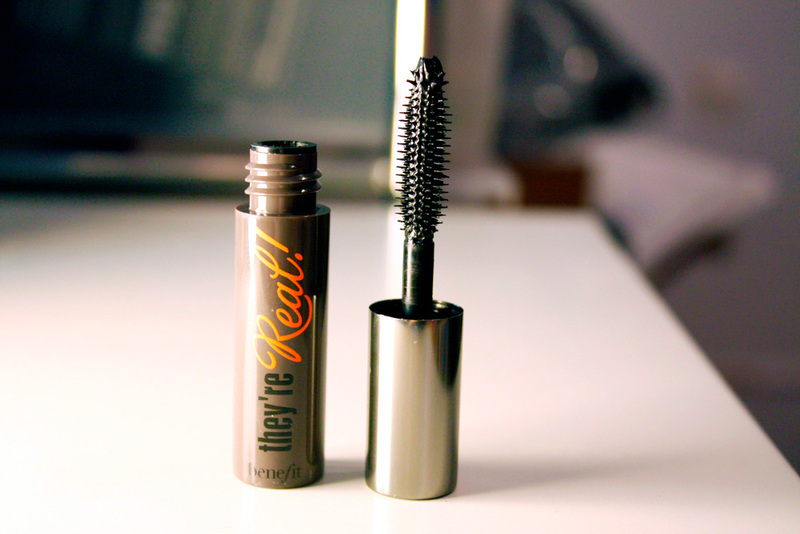 This mascara does wonders for lengthening your lashes! It doesn't flake off and will last all day! I’d definitely consider purchasing the full sizes of some of these products once I’ve used up this set! I think these style of kits are an excellent way of trying out a variety of products before spending a lot of money on a full size one that you may not like. Also a lovely gift for a make up lover or a sneaky treat for yourself. This the bronze of champions sells for £26.50. 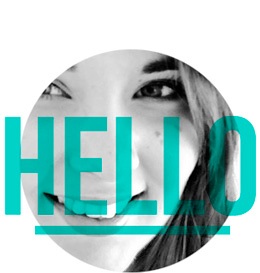 You can also pick it up in boots, john lewis and house of fraser. Have you tried this yet? Or any of the products? Let me know what you think if you have! Thank you, I used a canon 450D that I bought years ago!